It is important that we know exactly when something happened in the past. Because of this importance we need to understand the different ways we can use to express the 'when' an event occurred. Year: the most frequent way we express when an event occurred is by stating its year. For example, Canadian Confederation occurred in 1867 (pronounced "eighteen-sixty-seven). Decade: we can also state that something occurred over a period of time by saying which decade it happened. For example, the Quiet Revolution took place in Quebec during the 1960s (pronounced nineteen-sixties). This means that the event took place from about 1960-1969. We can also say that something happened in the 19th century. This also means that this happened between 1800-1899. Something that happened in the 12th century means that it took place between 1100 - 1199. Timelines are a useful approach to help contextualize when something happened in relation to something else. They can help us to visualize the order of events. 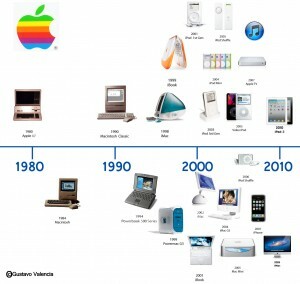 To the right you can see a timeline that explains the different products that the company Apple produced between 1980 and 2010. It allows to quickly see when, for example, the iPod was created in relation to the iPhone.